Omicsoft's Genome Browser allows companies, core labs, and individuals to visualize their genomic data like never before. Integrated fully with Omicsoft's Array Suite package (Array Server, Array Viewer and Array Studio), the Genome Browser can be used to visualize a variety of different data types, across cancer genomics, immunology, and more). 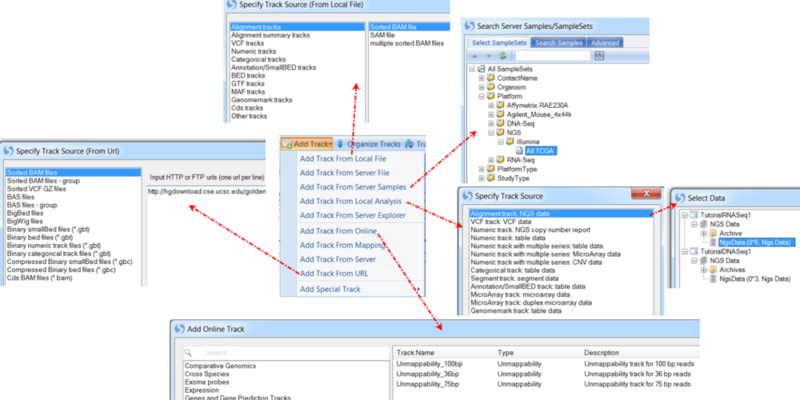 Tracks can be added from a variety of sources, and can be managed locally or by Array Server (as well as a full set of online tracks). Display different levels of each sequencing track, including coverage, exon junctions, variations (mutations), and read sequences. Display reads at the coverage level, as well as exon junctions and alignment profile, with options to turn on and off variations in the display. Filter reads to only show exon junctions, indel reads, first read, second read, forward strand, reverse strand and more. Find exact cutting points of gene fusions by looking at two genes at once for special fusion .bam files. Here we show the fusion of BCR and ABL. Omicsoft's Genome Browser allows companies, core labs, and individuals to visualize their genomic data like never before. Integrated fully with Omicsoft's Array Suite package (Array Server, Array Viewer and Array Studio), the Genome Browser can be used to visualize a variety of different data types. Trials are available for Array Studio, which includes access to our award-winning genome browser.